Enjoy this beautifully crafted home located less than 1 mile from Lutsen Mountains..
Lutsen Log Lodge 24 is a 3 bedroom, 2 bathroom log cabin home in Lutsen, MN View of the home as you approach it from the road. This home boasts vaulted ceilings and an open living space. Enjoy the spaciousness of this beautiful log cabin. The stone-surround fireplace is the centerpiece of the open living area and features a built-in flat screen TV. The living room opens into the kitchen and dining room area. Large windows allow natural light to enhance the feeling of spaciousness in the open living area. Enjoy a home cooked dinner at the dining room table - plenty of room for everyone. The kitchen is well-equipped and perfect for preparing meals during your stay. Dishwasher included - no need to wash dishes on your vacation. Walk into the private master bedroom in the loft. The bedroom boasts a king bed and plenty of windows for natural light. Curl up in the king bed after a long day exploring the North Shore. The master bedroom has a private bath with a walk-in shower and 2-person jetted tub. Fill the tub with hot water and bubbles and relax after a long day of skiing on Lutsen Mountains. The first guest bedroom has a queen bed. Plenty of room to unpack and relax. The second guest bedroom has a twin over full bunk bed. The main level guest bathroom has a shower/tub walk-in. Step out of the living area and enjoy the open back deck. The back area also features a fully enclosed portion of the deck- perfect for summer nights when the mosquitoes are out in force. Enjoy a meal on the porch or curl up on the futon and take a nap. Your search for a North Woods log cabin retreat ends right here! 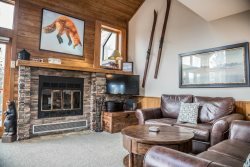 The Lutsen Log Lodges are a series of custom built log lodge homes located in the heart of Lutsen on Ski Hill Road. This log cabin boasts an open living space with vaulted ceilings and a beautiful stone-surround gas fireplace with inset flat screen TV. Nestled amongst trees in a safe and quiet neighborhood, you are also just half a mile from all of the action on Lutsen Mountains. In this home you will find a second level private master bedroom with king bed and private bath with 2-person jetted tub. The main level has two private bedrooms one with a queen bed and the other with bunk beds. The guest bedrooms share a full bathroom. A washer and dryer located in one of the closets will be helpful if you are not planning to bring too many clothes with you. The home can comfortably accommodate up to six guests, making it the perfect retreat for a family or group of friends wanting to come up to the North Shore to ski in the winter or explore the miles of nearby hiking trails in the summer. If adventure is what you seek, you've found it! The central location puts you right in the heart of hundreds of miles of hiking and mountain biking trails that weave back into the Superior National Forest. Up for a round of golf? Superior National Golf Course at Lutsen is right across the street! In the winter you can enjoy the groomed fat bike trails at Superior National, as well. Plus you are just 10-20 miles away from many other dining and adventure options in Tofte, Lutsen, and Grand Marais. Make Log Lodge #24 your home base for your next North Shore vacation, no matter the season! Guests With Allergies: Please note that while this is not a pet-friendly rental the owner of the property does have a cat and there may be some hair/dander present. Property was easy to locate, clean, and easy to access. Additionally the proximity to the mountain was unmatched. Very smooth check in process. Didnt even need to talk to anyone! Cabin was in a prime location on the ski hill. Perfect MN cabin in the north. All questions we had were immediately answered. My one call after hours was answered and question answered. The Log Lodge was in a great location. Just a minute off of the highway, but no road noise. It was just the right size for us and had all that we needed for a great weekend. Have always been very helpful. Central location to many trails, shopping, etc. along the north shore. The house was just perfect! The screened in porch was wonderful, and we got a chance to be outside by the fire pit to see shooting stars! Perfect location to the ski hill! Will definitely stay here again. Very nice. Wonderful location! Very quiet and peaceful! There was a Momma deer and her fawn who would come to eat next to home in evenings. We had everything we needed to make our stay comfortable! A Ma and Pa grocery store was nearby so we picked up food there. Showers were great, water was hot! There were a few little things that we wrote down for maintenance to look at but overall this was a wonderful stay! My favorite was the enclosed porch! Sat there morning and evening for coffe and reading! Loved it! The house was beautiful! Plenty of room, we enjoyed the fire place, grill and fire pit outside. The cabin was in the perfect spot right down the hill from the Lutsen Mountain where we went to hear great music and took the tram up the mountain with amazing views. Also one road away from the new North Shore winery! We would definitely come back to this cabin! Very quiet location and liked that the cabin didn't have real close neighbors. Bedroom upstairs was spacious, you could see the lake in the distance and three are French Doors to give privacy from the living area below. Great service with rental agency. The cabin was beautiful and the comfort of the beds was excellent. Great location to Lutsen ski resort. Had to cut our stay a day short due to an ski injury but other than that a great experience. we love this cabin! rent it every year! Great location for skiing. would love a hot tub on site :) love the kitchen and that dishes and linens are provided. A touch later check out on sunday would be nice...maybe like 11? Everything was perfect! Well appointed, clean, comfortable. The only disappointment was the lack of Wi-fi. We want to come back next year but are looking at other cabins w wi-fi...but we really would prefer this cabin again!!! This cabin exceeded all expectations! We arrived for a girls weekend Friday evening. It was dark, but had not problem finding the property. Lock box code and directions were clear and got us right into the cabin. The first words out of our mouths was "WOW". This cabin was absolutely beautiful! Three full bedrooms (plenty of room for us to spread out), the living area, the screened in porch - it was perfect. We were disappointed that we could not stay longer. We did not take advantage of the kitchen / grill like we should have, but did use the wine glasses every night. The cabin was clean and decor was rustic. Beds were very comfortable!!! I would recommend this cabin to anyone that would want to stay in Lutsen. We hiked Cascade State Park on Saturday, then took the tram ride. Thank you! We had a fabulous time. The cabin was perfect for our group. The floor plan was perfect and with the warm weather we really enjoyed and took advantage of the sun room. The location was perfect as it was really close to the ski hill. We are already planning another trip to Lutsen but may need a bigger cabin to fit 14-15. Really clean and homey. Loved the location. One thing I did not like was no fire pit outside.